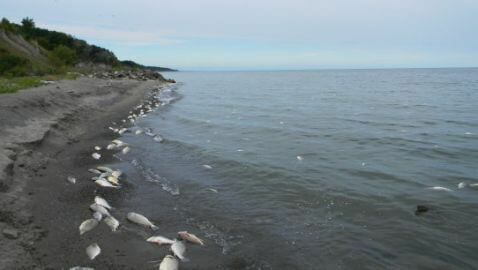 The dead fish and dead birds have been sent out to be tested to find out what happened. The Ontario Ministries of the Environment in Canada is looking into the possibility of a spill that could have changed the ecosystem. The other theory is that of an inversion, which occurs naturally when cold water hits the surface of the lake. The cold water, which has low oxygen levels, suffocates the fish. Those who have tested the water in Lake Erie have yet to find any abnormalities in the pH, temperature or oxygen levels. “We did not observe any spill or pollution impacting the lake,” Jordan said. The dead fish that were discovered included suckers, carp, catfish, sheepshead and perch. The medical officer of health for Chatham-Kent, Dr. David Colby, said, “All kinds of people were woken out of a sound sleep by a stench and it was like a septic tank was backing up.” Colby also proposed the theory of a fish disease known as viral hemorrhagic septicemia and Type E botulism. Colby did clarify that these are not harmful to humans.